The Chinese economy saw a solid start to the year with a 6.8-percent growth in the first quarter, official data showed Tuesday. GDP reached 19.88 trillion yuan (about 3.2 trillion U.S. dollars) in the first three months of 2018, up 6.8 percent year on year at comparable prices, unchanged from the growth rate in the previous quarter, according to the National Bureau of Statistics (NBS). 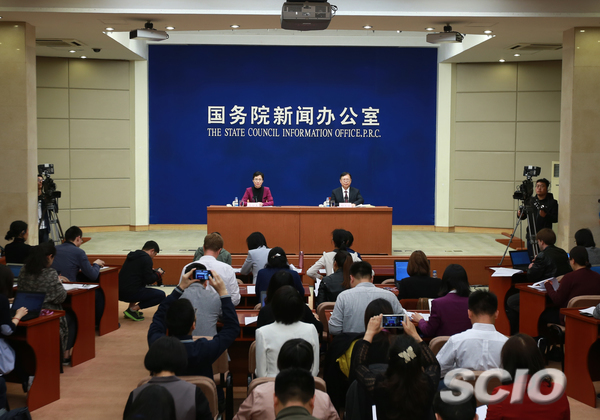 "The economy is off to a good start," NBS spokesperson Xing Zhihong told a press conference, noting sound momentum in development, steady progress in upgrading, and improved quality and efficiency of the economy. The GDP growth rate has stayed within the range of 6.7 percent to 6.9 percent for 11 quarters, with the jobless rate and inflation remaining stable, he said. New businesses and industries continued to grow fast, corporate profit and resident incomes steadily increased, while consumption and services played a bigger role in driving growth, he said. Services accounted for 56.6 percent of the economy and 61.6 percent of its growth in the first quarter. Final consumption contributed to 77.8 percent of the economic growth, up from 58.8 percent last year. Meanwhile, increased efforts to reform and open up boosted market confidence, with the manufacturing activity expanding for the 20th straight month in March and the consumer confidence index at a relatively high level, Xing said. The solid first-quarter performance extended the economic strength of last year, when China's GDP logged 6.9-percent growth, picking up pace for the first time in seven years. In the first quarter, industrial output and fixed-asset investment growth eased from the January-February period, but retail sales and private investment growth accelerated, the NBS data showed. With seasonality excluded, the positive trend remained unchanged, he said. Speaking of challenges, Xing highlighted possible impacts from rising protectionism, monetary policy adjustments by major economies and financial market turbulence. The U.S. administration has proposed tariffs on billions of dollars of Chinese goods and, in the latest move to heighten tensions, announced activation of denial of export privileges against leading Chinese telecom equipment maker ZTE Corp.
Xing said China is "fully capable" of handling trade tensions with the United States, citing the country's increasingly domestic-led growth, growing innovation edge, and ample room for development and policy control.